With every passing movie, the “found footage” gimmick is more than outstaying its welcome. It was inventive when The Blair Witch Project first did it, and it was used to harrowing effect and financial gain in Cloverfield, Chronicle and the ever-declining Paranormal Activity franchise. However, in the wake of films like The Devil Inside, Project X and Into The Storm, the sub-genre has become massively over-exposed to a point where it has become more of a nuisance than a stylistic choice. 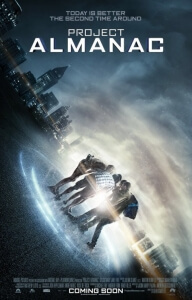 Project Almanac, the latest found-footage film to horrify audiences, is the final nail in the coffin as well as the freshly-dug grave. This is a film that so desperately wants to do what Back to the Future did thirty years ago, combining teenagers of the modern age and have them travel through time. What it sorely lacks is the charisma, entertainment and fun of that film and its sequels, as well as the coherence. Words cannot describe how much the “found-footage” aspect hurts this film; like any other film in the genre, we question why it was ever needed in the first place. If you take away all the irritating hand-held perspectives and jerky motions, it would work fine as a movie – not a good movie per se, but at least it would be comprehensible. Add it all back in, as the movie sadly did, and you get motion sickness within the first ten minutes thanks to how much the camera shakes itself about, as if these teenagers suddenly developed a serious case of Parkinson’s, and it continues like this for the entire movie. It gets in the way of how the story is unfolding, and we’re left completely stranded and confused by a series of images that aren’t made clear enough to the paying audience. Even for a found-footage movie, this camerawork is friggin’ insane – and certainly not the best kind. Nothing about this movie makes sense, either; there are numerous plot holes that would cause serious obstruction in any road. Here’s a couple of examples; our group of teenage outcasts constantly travel back to do stupid things like rig the lottery and attend a music festival, but when certain characters comes back to that same day to rectify a mistake, shouldn’t there be two versions of the same person instead of just one? We’re not scientific experts, but there should probably be a duplicate somewhere around the area that’s somehow missing out on the event he’s apparently supposed to be at (unless the newer version knocked out the other one, which wouldn’t add up in the slightest at all). Also, their escapades cause certain ripples in the timeline, such as a plane crash that somehow relates to an athlete being run over by a car and breaking their leg, and the only way to fix that is to stop him from being run over; that’s all well and good, but how in the hell does it all tie together? It not only fails to explain that, but also how such a minor incident can have just the slightest effect on whether a pilot crashes a plane with hundreds of passengers or not. In fact, why on Earth would going back a few months or so to attend a music festival result in anything being changed at all? There’s nothing that happens which would alter anyone’s future, so it’s completely out of the blue that there’s suddenly any change in the slightest. God, just thinking about this movie makes us boil with anger at how stupid and nonsensical everything is. The worst part, out of everything, is that it’s a complete bore; we’re not joking, this is the sort of film where you’d start to nod off to sleep after a short while. It takes a good 45 minutes for these people to even begin contemplating travelling back in time, and before then we’re placed with numerous character building that goes absolutely nowhere and leaves us not caring in the slightest. One character mentions that they are constantly bullied at school, but it’s never even brought up until she admits it and doesn’t even seem like the sort of person who would get bullied anyway; and everyone else is either just an attractive lamppost or just there. By the time they eventually do decide to go time-hopping, we’re so far into not caring that just watching the dimmed lights in the auditorium is more interesting than anything on the screen.